CBC News has confirmed that the Toronto police officer who fired shots in a fatal confrontation with a young man on a downtown streetcar is James Forcillo, a six-year veteran of the force. Newly released video shows the moments that preceded a fatal confrontation between a young man and a group of Toronto police officers on a downtown streetcar. CBC News has also confirmed that the officer who fired the shots — and who has been suspended with pay — is James Forcillo, a six-year veteran of the Toronto force. The video shows the Dundas 505 streetcar coming to a halt, its passengers quickly exiting the vehicle and later the sight of 18-year-old Sammy Yatim falling to the floor when he was shot. The new video was captured on a security camera from a store facing the side of the streetcar where the doors were opening. It does not have audio. After the passengers disembark, the video appears to show Yatim and just one other man on board the streetcar. Streetcar shooting: Will body-worn cameras help police and the public? The two spend almost a minute on board together, with Yatim staying seated. The teen then suddenly gets up quickly, and the other man, who may be the streetcar driver, gets off the vehicle. That happens at about midnight, when the streetcar has been stopped for about four minutes. The police soon enter the field of view of the camera. That's when the shots are fired — three at first, followed by a pause and then six more shots. These events happen by 12:01 a.m., just five minutes after the streetcar stopped. Numerous questions remain about the shooting that took place on the streetcar. Amateur cellphone video of the shooting was published online within hours of Yatim’s death, which has now been viewed by hundreds of thousands of people. 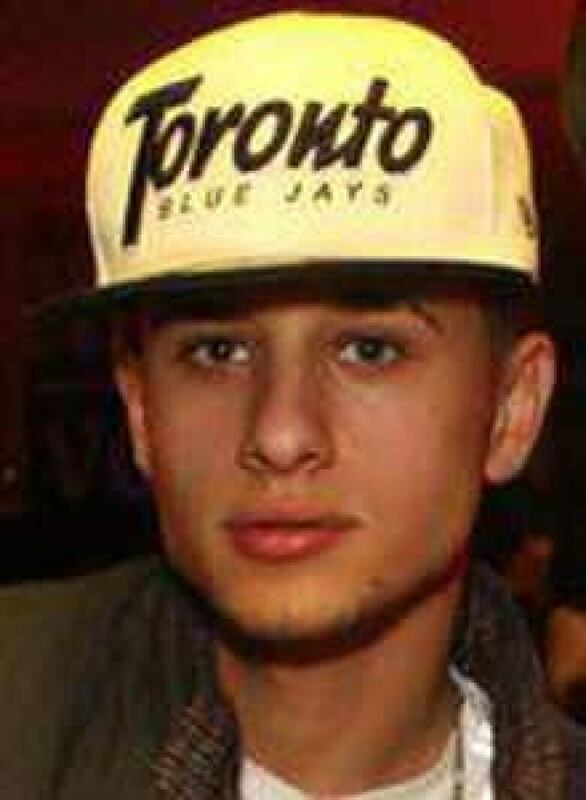 The full circumstances of his death are now under investigation by Ontario’s police watchdog, which has said that Yatim suffered "multiple gunshot wounds" when he was fired upon by a police officer. Twenty-two Toronto police officers have been identified as witnesses to the shooting, while just one officer fired the shots. On Tuesday afternoon, SIU investigators could be seen going door to door in the Dundas Street and Bellwoods Avenue area. They were also canvassing local businesses. 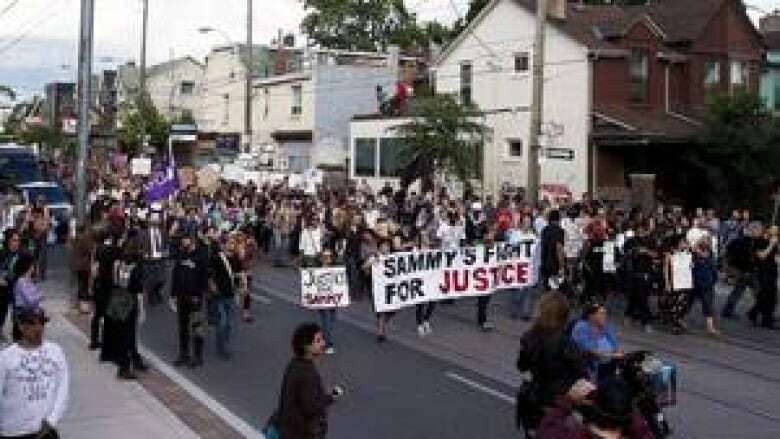 The footage published online outraged many Torontonians, including the hundreds who turned out to a protest march that started out in Yonge-Dundas Square on Monday evening and made its way to the part of Dundas Street West, near Trinity Bellwoods Park, where Yatim was shot. Mike McCormack, the president of the Toronto Police Association, has urged the public to wait for the full facts of the interaction to be determined before making conclusions about the police. "I can see why people would have questions, and that's a natural thing, and we're going to get the answers," McCormack said during an interview on CBC Radio's Metro Morning. So far, the public has learned that Yatim had come to Toronto from Syria just five years ago. He had graduated from a local high school and had plans to go to college in the fall. Joseph Nazar, a friend of the Yatim family, told The Canadian Press that the young man’s surviving relatives do not blame the wider police force for "an action of one police officer." For now, Nazar said, Yatim’s relatives are simply trying to arrange for his burial. Toronto police Chief Bill Blair made a statement Monday saying that he wants answers as much as the public. McCormack called both the suspension and the statement "extraordinary." Will body-worn cameras help police and the public? He said he plans to speak with Blair about why he chose to suspend the officer to make sure the proper processes are happening. "Our officer has not been accused or charged with anything at this point, and there’s been no finding of misconduct in any way," McCormack said. The union head said he's been in a similar situation and that lethal force is sometimes the appropriate response to someone armed with a knife. He said the public's questions about the incident are valid, but there are a number of variables that the video might not make plain, and people will have to wait for the SIU investigation. He said he doesn't believe there is a crisis of confidence in the Toronto police. "We've been through this before where people start to rush to conclusions," he said. McCormack said the force is legally compelled to co-operate with the SIU and that the investigation will be transparent, full, and frank. At least two experts agree with McCormack that people shouldn't rely solely on the video to draw conclusions. "It's very early in this process to determine any errors," Mike Summerville, a former Toronto police officer who now trains law enforcement officials in the use of force, told CBC News. He said the video can't stand alone, because viewers can't see what came before the video started, how Yatim is responding, whether the officer had a clear line of sight, or even if Yatim is in fact holding a knife. Greg Brown, a criminologist at Nipissing University in North Bay, said he doesn't judge particular incidents without hearing from the officers themselves. "I don't think anyone's in a position to judge right now," he said. Brown said that given the public's growing ability to record events involving police, officers in Canada should be commended, because there are so few examples of bad behaviour caught on tape. Peter Rosenthal, a lawyer representing the family of Toronto man Michael Eligon, who was fatally shot by police last year while armed with scissors, had a more critical view. He says the shooting is another in a series of "tragic, unfortunate and totally inappropriate police killings." Rosenthal said training is in place, but that police don't follow it on the street, perhaps due to a "macho culture." He said it may be time to reconsider whether all police officers should be armed, asking when was the last time a Toronto police officer shot a person who was an immediate threat. "The killings are always this type," he said.